2.7 million volt shock. Flashlight with bright LED light. Recharging cord included. 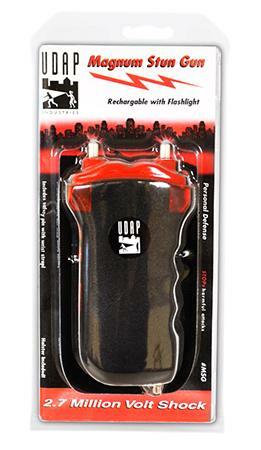 Convenient wrist strap with safety plug - stun gun will not operate if safety strap is removed. High DB alarm with red flashing lights to signal for help. Built-in rechargeable batteries.